The tech world has been buzzing with speculation for the past few days following the news that Google is erecting a mysterious floating structure off the coast of Treasure Island in San Francisco. Rumors for what function the four-story building will serve point to a massive data center or the company's first ever retail outlet designed to showcase Google Glass, but for now the search giant's plans have reportedly been put on hold by the local government. 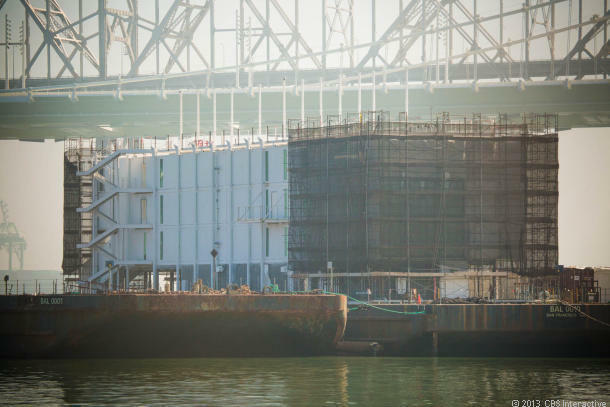 An anonymous source from the San Francisco Bay Conservation and Development Commission told CBS that "Google has spent millions on this," but never actually received a permit to erect the massive structure now floating in plain sight. Apparently, Google did meet with the local government, but wasn't granted a permit after it wouldn't reveal the purpose of the new project. Construction on Google's floating building may go from stalled to cancelled if the company can't smooth things out with local officials. The law concerning "bay fill" makes it clear that the Bay can't be used for any structure that could be built on dry land, so unless Google can prove its new project needs to remain off-land, we may never learn what the search giant had planned.